Mosquitoes are not only annoying; they can carry several diseases, including malaria and West Nile Virus. You really don’t want these flying menaces gatecrashing your summer cookout! Unlike other species of flying pests, mosquitoes aren’t interested in your food; they’re attracted to the carbon dioxide you exhale and to your sweat. That means that your bog-standard fly trap won’t work when it comes to catching mosquitoes. So, to keep you, your family, and your guests safe and unmolested by these biting pests, you’ll need to invest in a dedicated mosquito trap. If you live in an area where mosquitoes are a real problem during the warm, humid times of the year, you may want to buy a trap for inside your home and one for your backyard too. We’ve searched through the mosquito traps that are currently available on the market and come up with five of the best that we’ve reviewed and featured in our Buyers’ Guide. Click on the link to read the full lowdown on each product and to place your order when you’ve found a mosquito trap that perfectly suits your needs. The Hoont Mosquito Killer uses a fan and ultraviolet light bulb to draw gnats and mosquitoes into the unit. The trap has an attractive design and comes with a stand. The device can be used indoors or outdoors and gives a coverage area of about 1,000 square feet. The trap uses no toxic chemicals or foul-smelling attractants. The unit is waterproof, making it ideal for use on a patio or in a small garden area. This versatile mosquito trap can be used inside and outside too. The design of the trap means that it can be tipped over quite easily, which could be an issue if you have small children or pets. Hausbell’s mosquito trap is a very affordable and effective product that uses light instead of toxic chemicals to attract mozzies and gnats. The unit can be operated manually or via a light sensor. The unit is very quiet when in operation. The trap gives off a pleasant blue light that’s unobtrusive and creates a nice ambiance. No maintenance of the device is required, other than occasional cleaning. 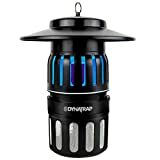 The trap is effective in catching mosquitoes and larger pests; however, it doesn’t seem as effective in catching gnats and other, smaller nuisances. The Flowtron BK-15D is a traditional electrical insect zapper that’s designed for outdoor use. The unit is powered by a 15-watt bulb, giving roughly half an acre’s coverage. If you need to cover more area, just buy the additional Octenol attractants. Simply pop the bait into the cup, and you’re all set. The Flowtron is very easy to use. The unit can be highly effective in controlling large numbers of mosquitoes. The trap doesn’t need frequent cleaning. 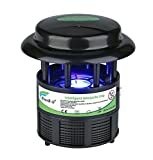 Powerful mosquito attractants are built into the unit. If you use the unit regularly, you may need to replace the light bulbs frequently. The suction fan can miss some mosquitoes. Replacement parts tend to be expensive. The unit does also attract and kill beneficial creatures such as bees and bats. This unit is a trap, rather than a zapper. The magnet uses three different attractants to draw mosquitoes into the suction fan, which captures and kills them. The attractants are an ultraviolet light, a titanium dioxide coated surface, and carbon dioxide. Also, the trap is designed for outdoor use and is weather-resistant, providing coverage of up to one acre. The unit is very easy to use; just plug in and start up. The trap provides half an acre of coverage. This product is quite pricey compared to others. The power cord is short, restricting where you can place the trap. The attractants are very effective, so you can’t place the unit too close to your house, or you could be overrun with mosquitoes! The Patriot works by using a carbon dioxide attractant, heat, and moisture to draw mosquitoes to the trap and sucking them in via flared outer tubes. 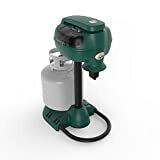 The unit has a 50-foot power cord, but it doesn’t come with the attractant or the propane you’ll need, so you need to buy them separately. The Patriot uses unique, patented “Counterflow” technology to attract and trap mosquitoes. The trap offers a full acre of coverage. The unit doesn’t come with the necessary attractant, meaning that you have to buy it separately, pushing up the cost of the trap. Indoor or outdoor mosquito traps? Indoor mosquito traps are very effective when used inside a small, enclosed room where there are a limited number of bugs to catch. For best effect, you need to set the trap, close the door, and leave the room. If you stay inside, the mozzies will most likely go for you and not the trap! Indoor traps are usually portable and inexpensive, using heat and light to draw the bugs to the trap. Outdoor mosquito traps are designed to reduce and control the number of biting (female) mosquitoes in your outside space. Eliminating the females lowers the reproduction rate of the population, eventually eradicating the problem. Outdoor traps must be powerful enough to draw insects from a wide area. Even so, an outdoor trap can take up to eight weeks before you’ll notice any significant reduction in mosquito numbers. So, how do mosquito traps work? Most mosquito traps use a chemical lure called Octenol. Octenol mimics the chemicals given off by the human respiratory system, including carbon dioxide. Some mosquito traps also have a suction system that pulls the insects into a waiting net where they are exterminated with heat. Sticky lures are also used in some traps. When an insect lands on the lure, it can’t fly away again, making it easy for you to kill it. Traps using this strategy are more effective for indoor use. Most mosquito traps need a source of power to operate. Some are electricity driven, whereas others run on propane gas. When choosing a mosquito trap, you’ll need to consider where you want to use it and what power source it requires. Once you’ve chosen and ordered your new mosquito trap, you’ll need to know how to use it to best effect once it arrives. One mistake that many homeowners make is to choose a mosquito trap that’s not powerful enough for their needs. If you have a big garden or patio area, buy a trap that is designed to cover more than that area. That will ensure complete protection, even if it does come at a higher price. If you have a huge backyard, you might want to buy more than one trap. Mosquitoes come in different varieties. If the trap you choose is to be most effective, you’ll need to pick one that targets the species that troubles you. If you’re not sure which variety of mozzies are swarming in clouds around your barbecue area, ask your local council or pest controller for clarification on the mosquito species that are prevalent in your area. Place indoor traps in areas of your home that have minimal traffic. If you put a mosquito trap in a room full of people, the humans will undoubtedly be of more interest to the mozzies than the trap! The best strategy is to set the trap in an empty room and allow an hour or so for it to do its work. Then, when you re-enter the room, it should be a mosquito-free zone. When setting an outdoor mosquito trap, place it close to dense vegetation, shade, and/or still water. Mosquitoes are attracted to these areas and are more likely to be caught by the trap than if you put the device in an open area away from shelter and water. Mosquitoes are most active during sunset and sunrise, so this is the time to target them. Therefore, with your trap set in the best place and at the right time, you’ll stand a much better chance of enjoying good results. For the trap to work efficiently, it must be correctly maintained. So, remember to replace the propane fuel source before it runs out, have a spare UV light bulb or supply of Octenol in your home, and clean out the trap on a regular basis as per the manufacturer’s instructions. Finally, be sure to allow plenty of time for the trap to work. That applies especially to outdoor traps; it’s not reasonable to expect your home and garden to be completely free of mosquitoes in just a day or two. Most outdoor traps take at least a month to six weeks to be fully effective in reducing mosquito numbers. In this section, we’ve covered many of the most commonly asked questions about mosquito traps. If you can’t see the information you need, just drop us a line, and we’ll do our best to help you. Q: Are mosquito traps safe? A: Mosquito traps are safe to use around people and pets. The traps don’t give off toxic chemicals, and many are specially designed not to harm beneficial insects such as bees and moths. Q: How long does a propane tank last on a mosquito trap? A: If you run a propane-fueled mosquito trap for 24/7, you can expect the propane tank and the attractant supply to last for around 21 days. Be sure to replace the tank as soon as it runs out to optimize your mozzie catch rate and disrupt the breeding cycle of the insects in your backyard. Q: Does propane attract mosquitoes? A: Indirectly, yes. A propane mosquito trap burns propane, creating carbon dioxide by using oxygen contained in the air to burn itself. By using a combination of Octenol and carbon dioxide, a mosquito trap will draw mosquitoes to their deaths. Q: Does light attract mosquitoes? A: Yes, light does attract mosquitoes. That’s because mozzies and other insects instinctively use the moon as a nighttime navigation aid. So, a bright light hanging outside your home draws the winged menace as they mistake it for the moon. Q: Are mosquito bites poisonous? A: No. However, mosquitoes can carry some dangerous diseases. When you’re bitten by an infected mosquito, it can inject those diseases straight into your bloodstream. However, mosquito-related illness is pretty rare in the U.S. The worst you’re likely to suffer is an infected mosquito bite. Q: Can I catch HIV or AIDS from a mosquito bite? A: No. HIV cannot survive or replicate inside a mosquito. It’s technically possible for a mosquito that bit an HIV infected person and then immediately bit you to pass on the virus. However, that’s an incredibly unlikely scenario. A mosquito that’s just fed will immediately seek shelter to digest its meal before resuming hunting. During the insect’s downtime, the virus would die. Mosquitoes are a summertime pest that nobody wants in their home or backyard. At best, these critters are an irritating annoyance, and at worst, they could carry disease. So, you need to get yourself a mosquito trap when the weather warms up and the humidity levels rise to keep the little beasties away. 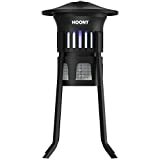 Of the traps we’ve reviewed in our Buyers’ Guide, we especially like the Hoont Mosquito Killer. The trap is very efficient and effective in attracting mosquitoes, trapping, and killing them. There are no smelly, poisonous chemicals to worry about, and the trap can be used both indoors and outdoors.